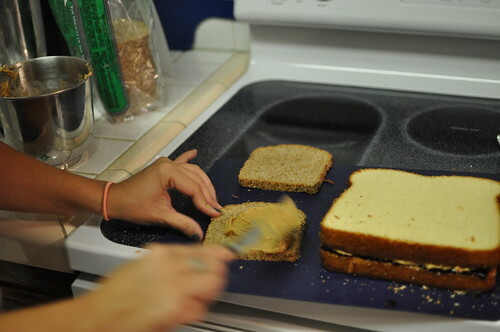 Hello Moye · Giant Baking Adventures: Cakewich Success! 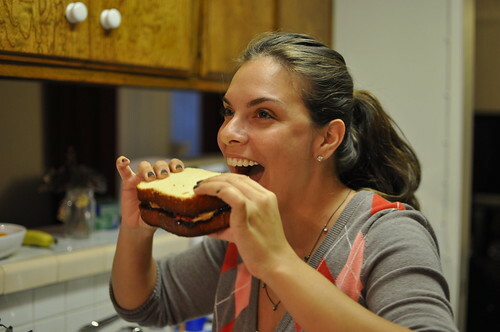 Giant Baking Adventures: Cakewich Success! 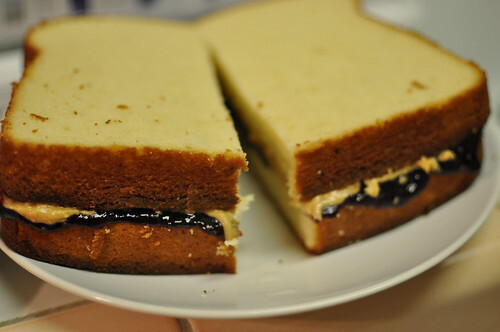 So this may look like a normal peanut butter and jelly sandwich, but it’s not. Lisa and I swear. 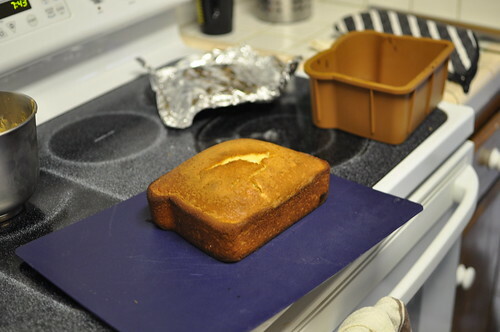 We met up this past weekend to finally bake the amazing Cakewich, which was really just a cake mold shaped like a slice of bread. 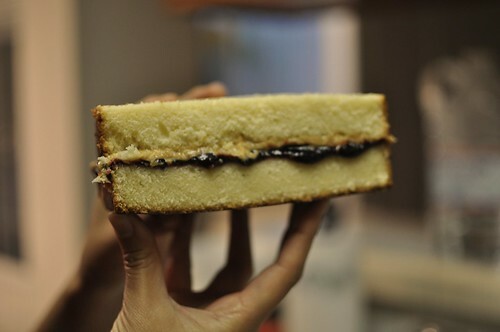 Armed with my new How To Cook Everything iPhone App and some almond extract, we somehow managed to mix together Mark Bittman’s Golden Layer Cake recipe to slap together this amazing creation. My camera ran out of batteries during the first part of the process, so I didn’t get any snazzy photos of Lisa’s amazing cake batter skills, and then we had a little emergency when we realized we didn’t have any powdered sugar for the peanut butter frosting. Plus, this cake took twice as long to bake than we expected. And then I had to pick up B from LAX while Lisa had a date at Dodger Stadium, so we decided to let the cake cool for 24 hours and meet up the next day to finish the Cakewich. Did you follow all of that? I thought so. So anyways, last night at Chez Lisa, we rolled up our sleeves and got to work. 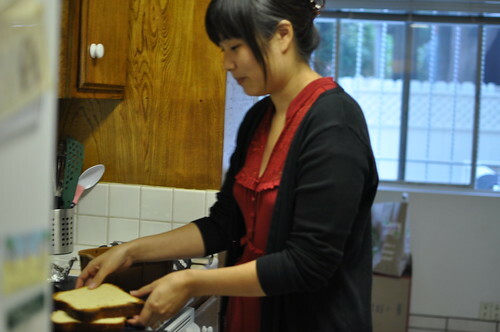 First, we sliced off the top mound because sandwiches don’t have mounds on them and we had to make our cake resemble a slice of bread as much as possible. 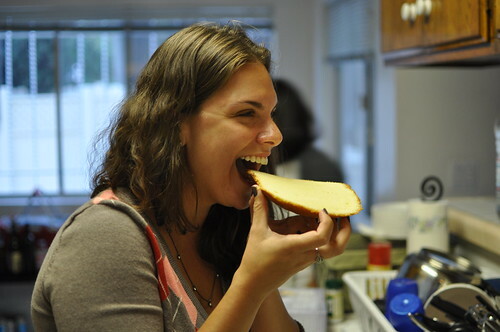 Lisa got excited about the excess cake and decided to take a bite. 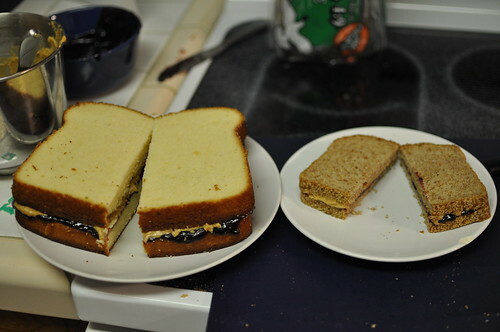 Then I sliced the cake in half to complete the sandwich. 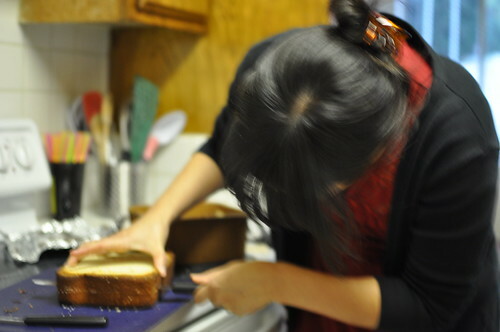 This is me carefully sawing my way through a Golden Layer cake. 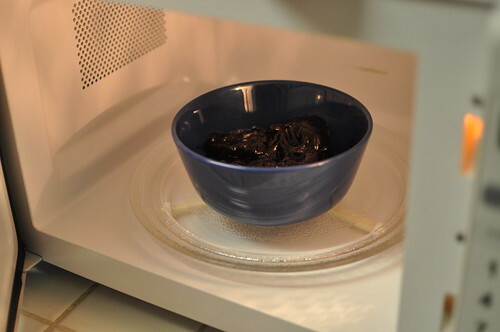 Wait…hold up. I’ve never really looked at the top of my head before. Is that my hair part or AM I BALDING? OMG I’M BALDING. Now I have to invest in that weird scalp powder thing that covers up bald spots. Waaah. 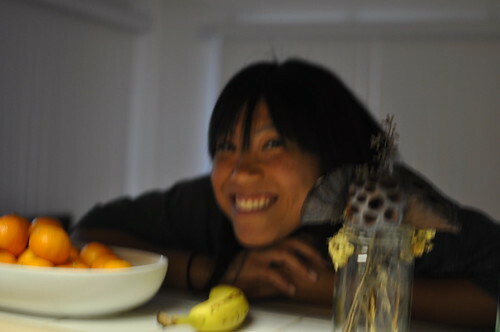 We recruited Lisa’s roommate, Bobbie, as our new G.B.A. member (Giant Baking Adventure) since she was so cute and took over the camera. I got the two “slices of bread” ready for some frosting. Lisa warmed up the jelly or jam or preserves or whatever it was. Commence frosting. 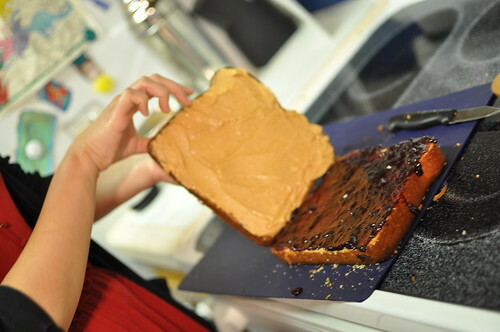 Can I just gush about how amazing this peanut butter frosting was? It only consisted of butter, peanut butter and powdered sugar which together tasted like heaven. This part was a little uneventful. To be honest, it was actually a little disappointing. 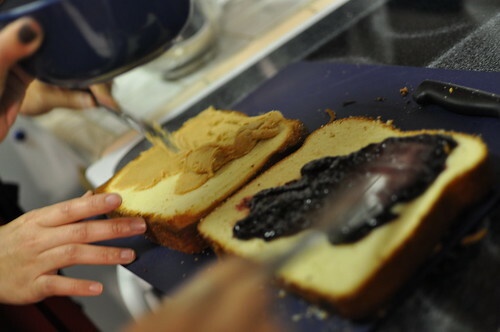 Lisa and I realized that frosting this cake was really just like…making a giant peanut butter and jelly sandwich. Surprising, I know. But hey, it was still giant!! Here we go! BAM! 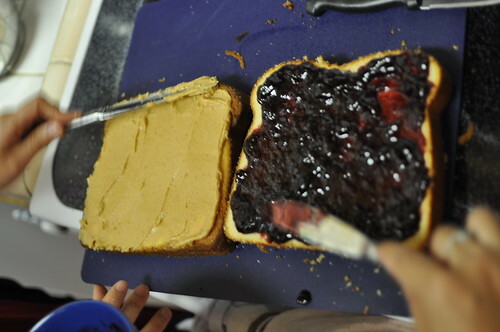 Then we realized that it really did just look like a giant peanut butter and jelly sandwich. This was kind of a letdown. 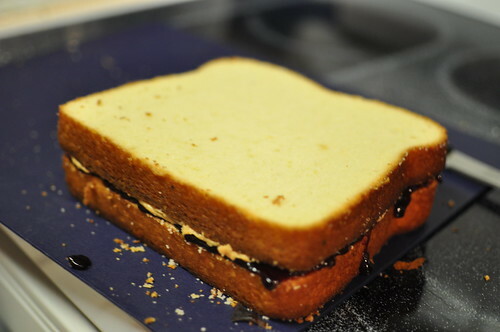 So Lisa made a regular sized peanut butter and jelly sandwich as a comparison with the cake so we could show everyone that yes, we DID MAKE A GIANT SANDWICH CAKE. So there. See? Now you believe us? 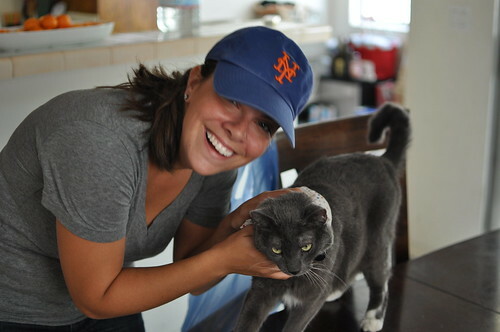 Then we decided to see if Henry (Lisa’s cat) would like a nibble. He did not. 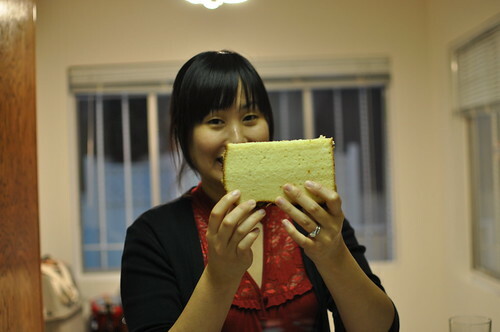 So now it was time for each of us to pose with the sandwich cake, as if we were eating a regular sandwich. That’s one big sandwich slice!!!!! Holy cow. This is amazing. You are missing your calling as a giant novelty cake-baker. This looks awesome and delicious. I think you should do giant black & white cookies next. I want in on the GBA. But mostly to eat all your giant food.